For more information on NSW and Victorian firearm permits and licences please refer to the links below, we can also assist you with information concerning accredited firearm safety courses. Courses are held regularly. 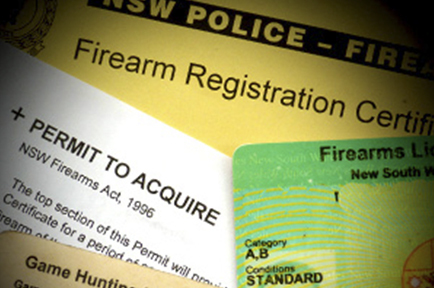 For more information on courses and acquiring a NSW firearms Licence please contact us. Contact the Wodonga Police Station, 100 Hovell Street, Wodonga. Phone: (02) 60492600 for available dates and times of the safety course which is held locally. Mounting and sighting a scope takes time and precision. Trust our gun pros to mount and boresight your scope quickly and accurately at no charge. Elks Hunting & Fishing offer a storage facility for your firearms, short or long term storage is available. All firearms are safely stored and insured whilst on our premises. Permanent storage is also available for those who do not wish to personally store their firearms. Permanent storage customers who wish to use their firearms can make arrangements for pick up and drop off. Please contact us to make further enquiries. Elks Hunting & Fishing offers a full gunsmith service, our staff are highly experienced and we provide all levels of gunsmithing. So whether you are considering a strip and clean for your rifle or shotgun or something more complex get in touch with us for further details.